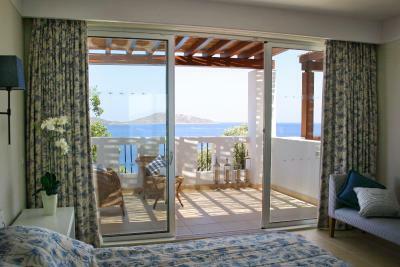 Lock in a great price for Sensimar Elounda Village Resort & Spa by Aquila – rated 9 by recent guests! The staff are great, nothing is too much trouble. The facilities are lovely. We liked everything especially the friendliness of the staff. We had two massages and the girls were excellent. 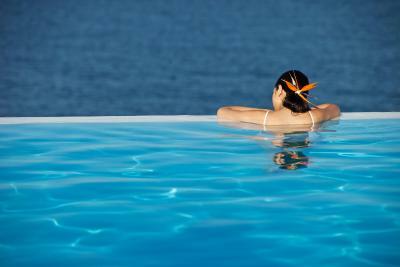 I knew that it was an upmarket resort but it exceeded my expectations in quality and services. We enjoyed everything about our stay. The hotel was fabulous and the staff were very helpful. The setting was magnificent. The all inclusive was very good. Facilities are good and good restaurants. Bed was very comfortable and there was a kettle in the room so we could make our our own refreshments. A free bottle of wine and water were also included. Will return!! A beautiful hotel. Stunning location. The staff were incredibly welcoming and helpful. The hotel go the extra mile to make sure your stay is the best it can be. 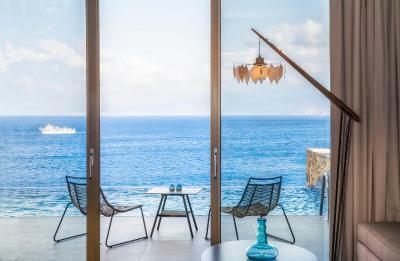 Sensimar Elounda Village Resort & Spa by Aquila This rating is a reflection of how the property compares to the industry standard when it comes to price, facilities and services available. It's based on a self-evaluation by the property. Use this rating to help choose your stay! On a private, sandy beach overlooking Mirabello Bay, this Aquila Elounda Village features award-winning cuisine, a spa, a tennis court and 5 outdoor pools. 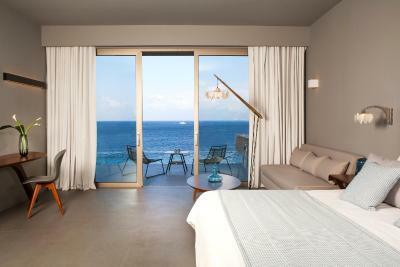 It offers accommodations with sea and garden views or private pools, surrounded by lush gardens. 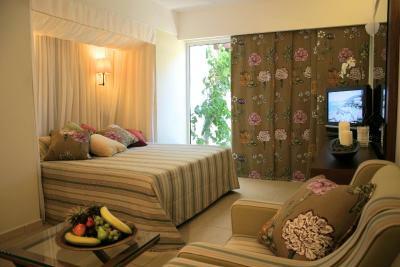 The elegant, air-conditioned rooms have an LCD TV and CD player. 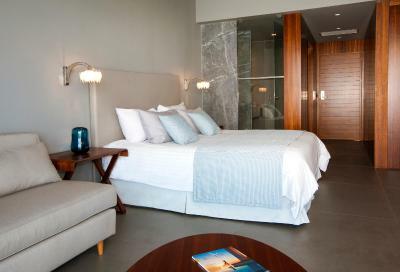 There is a minibar and coffee-making facilities, while wine and fruit await guests upon arrival. Guests wake up to an buffet breakfast. Lunch includes Mediterranean dishes and is served at the Mirabello Restaurant. The Greek Taverna Symposium serves original Greek and Cretan specialties. Candle-lit dinners on the beach can be arranged. 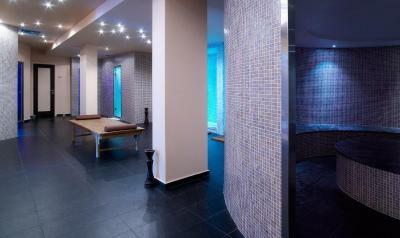 Guests can enjoy free use of the sauna and gym, and free use of lounge chairs, umbrellas and showers. 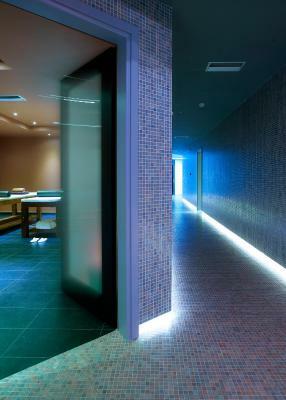 The spa features a heated swimming pool and 6 treatment rooms such as a chromotherapy cabin and ayurvedic suites. 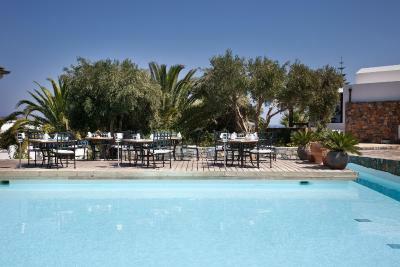 The Aquila Village is 4 miles from Agios Nikolaos, and only 2 miles from the fishing village of Elounda. 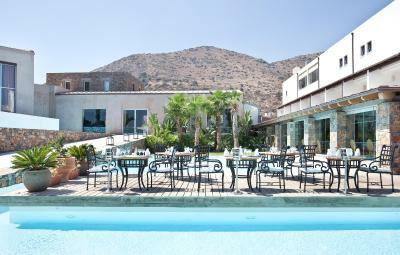 Spinalonga Island is across from Elounda and features an ancient Venetian Fortress. Public bus is available at the hotel entrance in high season. 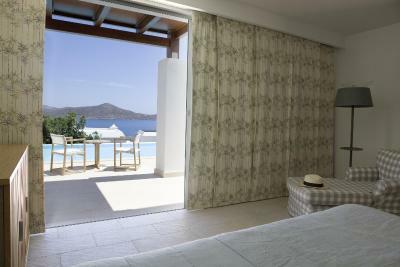 When would you like to stay at Sensimar Elounda Village Resort & Spa by Aquila? These elegant suites feature an open plan lounge with couch, bedroom, marble bathroom, and a balcony overlooking the Elounda Gulf. 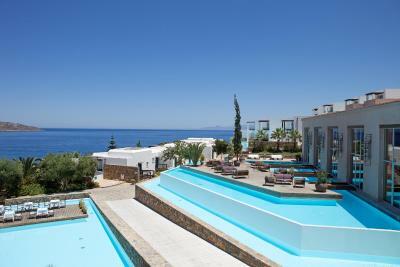 -	A welcome pack with champagne, fresh juice, flowers, fruits, wine and Greek sweets. -	Invitation to the management cocktail. -	Exclusive Guest Relations Service. 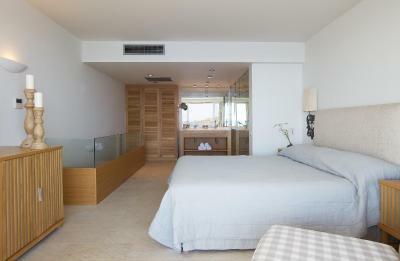 The spacious superior bungalow has marbled bathroom with bathtub and separate shower, and balcony with sea view. 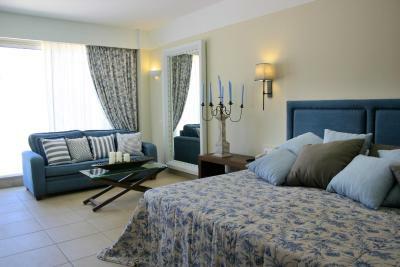 It is elegantly furnished in a colonial style. Consisting of 1 bedroom and terrace overlooking the gardens, these bungalows are beautifully designed with wooden furnishings in blue and white for sea view bungalows and olive green for garden views units. 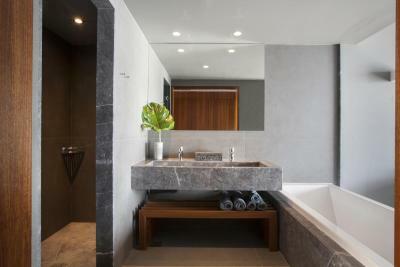 They include marble bathrooms. Special features include a pillow menu, and CD player. 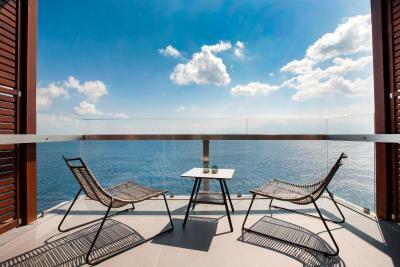 The spacious superior bungalow has private outdoor area with pool, and balcony with sea view. 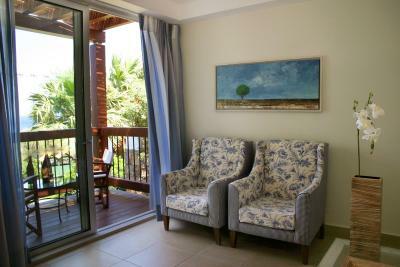 It is elegantly furnished in a colonial style. Consisting of 1 bedroom and terrace overlooking the sea, these bungalows are beautifully designed with wooden furnishings in blue and white for sea view bungalows and olive green for garden views units. They include marble bathrooms. Special features include a pillow menu, and CD player. 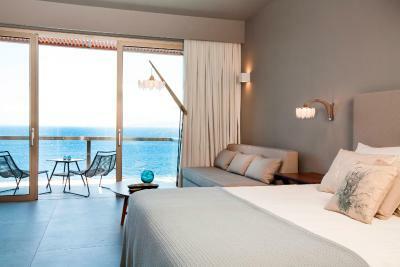 Nestling on the edge of the cliff, this suite offers breathtaking views over the pristine Aegean. 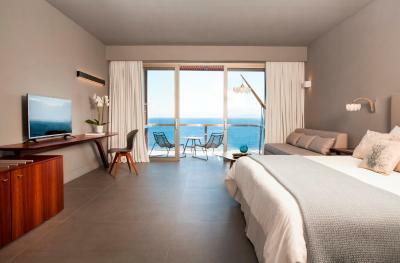 It consists of a bedroom with open-plan sitting area, en-suite marble lined bathroom with bathtub and separate rain shower cabin. 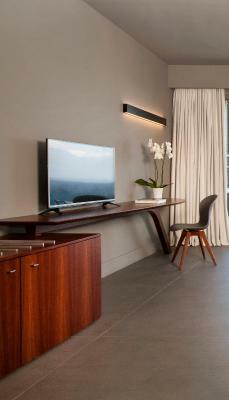 An exclusive line of contemporary wooden furniture compliments the sense of uniqueness. 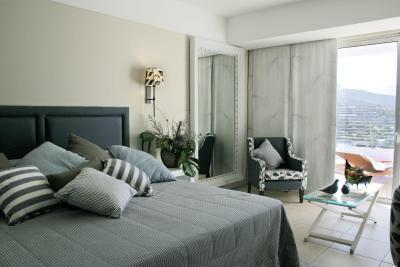 The majority of these suites feature walk-in closets. 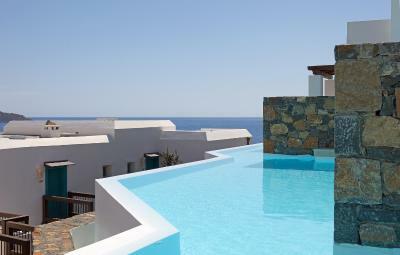 Resting on a stunning location over the sea, this bungalow features a spacious infinity pool and magnificent sea views. 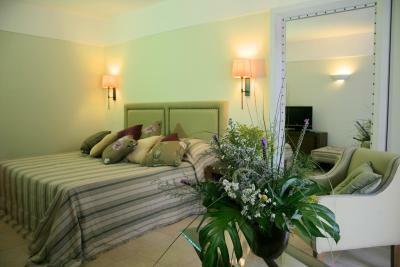 It consists of a bedroom with open-plan sitting area and en suite marble lined bathroom with rain shower. 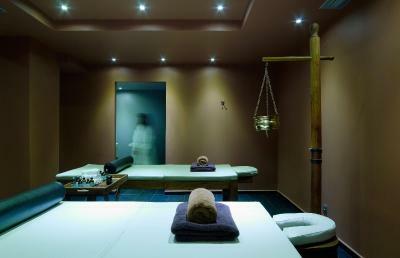 It is carefully styled with modern wooden furniture and unique touches of elegance. The ground floor consists of a large sitting area with sofa beds which are serving as an extra bedroom for children and one bathroom, while the first floor consists of one main bedroom, a marble lined bathroom with luxurious toiletries and bathroom amenities and spacious balcony with exclusive wooden furniture.. The spacious outside area has a wonderful garden with colorful flowers. 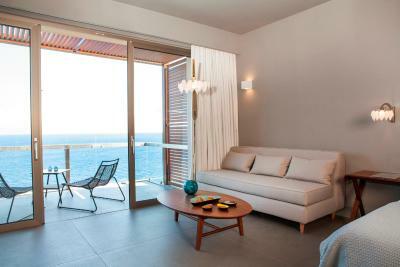 A private terrace with bamboo furniture and a private heated outdoor swimming pool is also available. Special features include manually controlled air conditioning, large screen LCD TV, mini Hi-Fi system with CD player and safety deposit box. 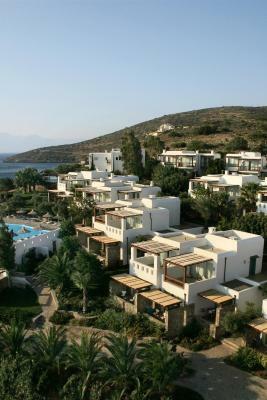 The Aquila Elounda Village is set on a private beach overlooking Mirabello Bay approximately 3kms from the centre of Elounda and 7kms from Agios Nikolaos. The stunning pool complex complete with waterfalls, is the perfect place to relax whilst there is a choice of dining either indoors at the main buffet restaurant or al fresco at the à la carte restaurant, offering a fine selection of local and Mediterranean delights or at the Cretan “Symposium” restaurant with original Cretan specialties. 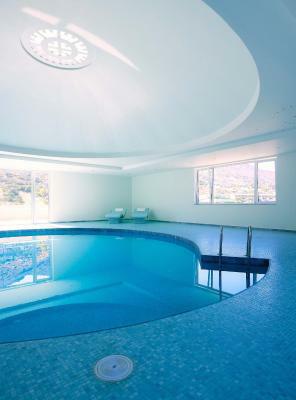 House Rules Sensimar Elounda Village Resort & Spa by Aquila takes special requests – add in the next step! Sensimar Elounda Village Resort &amp; Spa by Aquila accepts these cards and reserves the right to temporarily hold an amount prior to arrival. Sensimar Elounda Village Resort & Spa by Aquila accepts these cards and reserves the right to temporarily hold an amount prior to arrival. No children under 16 years old can be accommodated. Hotel policy requires that gentlemen wear long trousers in all the hotels departments during the evening. Please note that the hotel reserves the right to pre-authorize your credit card before arrival according to hotel policy. 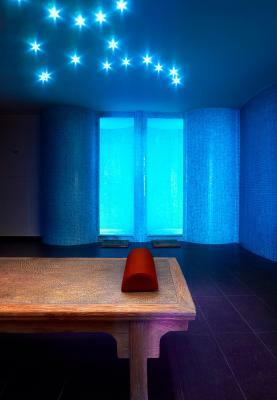 Please inform Sensimar Elounda Village Resort & Spa by Aquila of your expected arrival time in advance. You can use the Special Requests box when booking, or contact the property directly using the contact details in your confirmation. REALLY?! In a 5* hotel? We then asked for an extra mirror to get ready in front of the TV, and we received one - with diameter of approximately 7 CM, good enough to magnify your pimples but not to do your hair...!!! Also, they don't have an iron or iron board in your room, you have to walk across the entire property, into the basement of main building to iron your clothing in what was previously a bathroom. No ventilation. Good luck not sweating like a pig! That wasn't the end... Because this hotel is for seniors, the management thinks people will forget when their check out date is (which is all kinds of wrong and disrespectful, but thats another story) and they practice a very interesting (read annoying) checkout policy. They will call you at least 24hours ahead of your checkout time to remind you that you have to leave the room. What do they do if you don't speak English? They keep on calling (read harassing) you 4-5 times until you don't pick up your phone anymore. Imagine you are trying to relax by your private pool and have someone calling you the ENTIRE DAY LONG until its 20:00...?!?! REALLY TUI SENSIMAR STAFF?! We stayed for 2 days!! We know when we are leaving!! You see people don't understand you, why do you keep on harassing them?! This is so not 5* behaviour!!! At the checkout the so-called front office manager could only say "We apologise for that, if you would have stayed longer with us, we would make you understand we are a good hotel..." Ehm, what a heartfelt apology that was. She really lives in denial. What a disgrace. OH, BTW, our room was not cleaned the entire day long, despite having a "Please clean my room" sign the entire day long. Xaridimos at the front desk - please pay more attention to what the guests are asking you, like sending housekeeping to our room and less attention to how short my dress was. Very unprofessional behaviour, I never felt less comfortable. 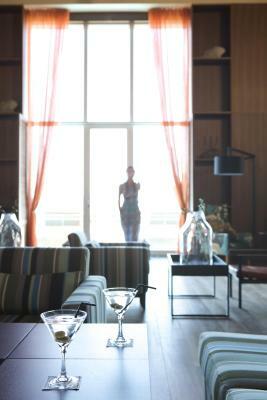 Check-in was really good, thanks to Zaharias and Manolis. But that's about it, after check-in everything went down hill. Since we don't have enough space, pls consider this entire section as negative as well. First thing you should know about this hotel - it is for seniors, which is clearly reflected in the quality of food. We had one of the worst breakfasts in Greece at this property, and not because of lack of variety. They had a lot of different things to chose from, all however were at sub-par quality. Fruit was green/not ripe, eggs were overdone and FULL of oil, generic brand Nutella was terrible. On Sunday some food items were simply re-heated from previous day breakfast (like pancakes!). There was no restaurant open from 15:00 till 19:00, and we are talking about all-inclusive hotel! Also, be aware that your in-room dining is NOT included in your 50EUR/person/day "all-inclusive" package. Also you have to pay something extra for more expensive dishes at the restaurant (like seafood!). As we were getting ready for a wedding, we asked for an electrical plug extension, since there was no plug near the bathroom or near any mirror, which basically makes it impossible for a girl to get ready or for a guy to have a decent shave. We made 3 calls to reception, only to receive 30 minutes later a UK PLUG!?! WHY WOULD WE NEED A UK PLUG IN GREECE?!? When we asked for a normal, EU-type plug, 30 minutes later they told us, sorry we don't have one... They don't have electric extension in the entire hotel?!?! The room was lovely with a wonderful view. In short: Premium All Inclusive is not what it's meant to be, and there is a sunbed reservation prohibition which is NOT enforced. In long: We booked a premium All Inclusive room (Mythica). This term implies it's even better than All Inclusive - but again it proved to be a "somewhat inclusive". 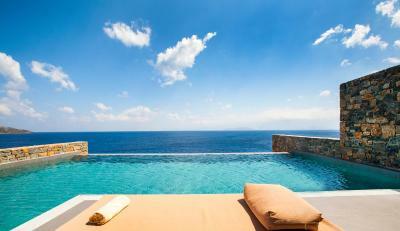 Wenever we book a holiday, we're perfectly willing to pay more to get All Inclusive, especially in 5-Star-Resorts. But again we found menus in every bar and restaurant with certain drinks and dishes excluded from the Premium All-Inclusive Deal. This is annoying especially because the free dishes were usually smaller, almost pushing you to get the paid ones. The lobster and firepit specials were ok - I'm perfectly willing to pay extra for these, but not for a tuna salad if I'm booking not only All Inclusive, but PREMIUM All Inclusive. Mind you: I'm perfectly willing to pay for this, but rather up front than having to see a price next to ever item on a menu! If I want this, I book half-board... 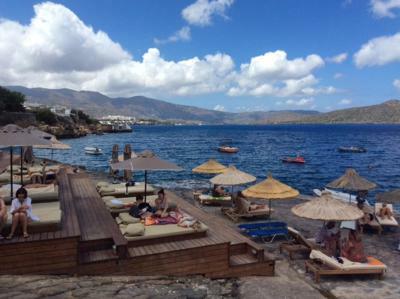 The other issue we found is one that I always fear when going to beach / pool hotels - tourists reserving sun beds. 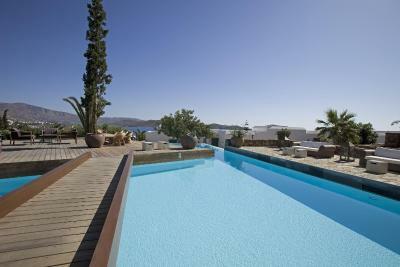 You might expect this in a cheap 3* hotel on Mallorca, but not a 5* like the Elounda Village. I have to admit that after about 4-5 days it got better because somebody probably complained about the people who reserved sunbeds at 8 AM despite there being notes and info displays EVERYWHERE, noting that it's absolutely prohibited to reserve sunbeds. The problem was, that staff never enforced this rule for the first couple of days. Very, very annoying as it adds unnecessary stress if you just want to casually get your breakfast and then enjoy the sun on a sunbed - impossible if some idiot blocks from using them only to show up three hours later. This really needs to be properly enforced. The hotel wasn’t very Greek....it was a very international/generic hotel which we appreciated in many areas but not so in the menus offered. We think they missed a trick as we could have been on any island, anywhere. I was asked whether I would like to change room on my last night as someone had booked to stay in my room. Bathroom in the room is not separate. WC door cannot be closed. Door that is suppose to separate the sleeping area from the bathroom was not working properly.